Nashville, TN (February 17, 2015) – Florida Georgia Line is getting their “Sun Daze” on this week, taking over Country radio with their sizzling, GOLD-certified smash landing at #1 on both the Mediabase and Billboard Country Airplay charts. Featured on their GOLD, chart-topping sophomore album ANYTHING GOES (Republic Nashville), “Sun Daze” marks the superstar duo’s sixth run atop the charts and follows the buzzed-about PLATINUM #1 hit "Dirt." "We are real proud of 'Sun Daze' because that song came about so late in the game. It was one of the last ballpark tour dates we did with Nelly, but we were still finishing up the album and inspired to write that day,” shares FGL’s Brian Kelley. “We thought we pretty much had every song we wanted but this one definitely kicked one of the songs off. It shows that right down to the wire you need to keep writing and stay in your creative zone. We knew we had something special." 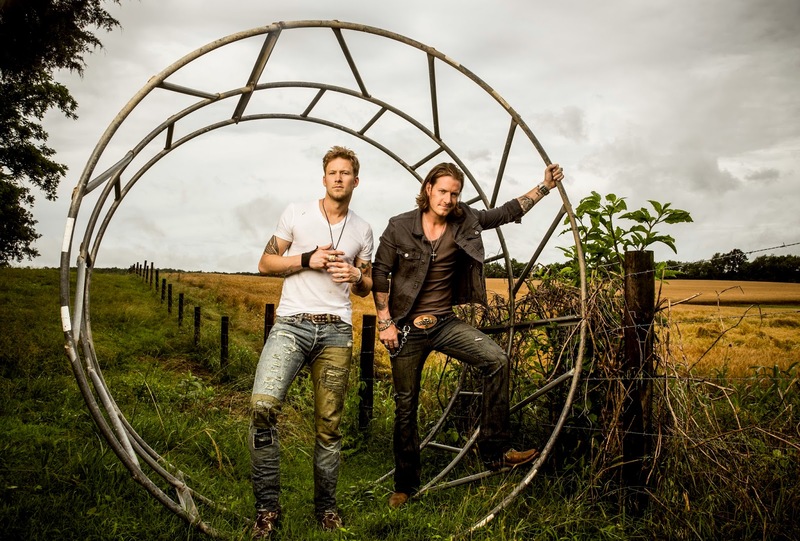 FGL ignited Billboard’s latest Hot Tours ranking as their ANYTHING GOES TOUR 2015 earned the #3 spot, right behind Andre Rieu and Billy Joel, and solidified them as the lead Country act on the list. The award-winning duo kicked off their North American trek with a sold-out show at the Huntington Center in Toledo, OH, on January 15 and boasts total attendance surpassing the 60,000 mark in the first six cities. The dynamic pair will bring their seize-the-day attitude and raucous party anthems overseas for the first time with four shows on the C2C Country to Country festival tour in Europe this month. In addition to the ANYTHING GOES TOUR stops, fans can catch FGL at several festivals nationwide and select stadium dates on Luke Bryan's KICK THE DUST UP TOUR. The reigning ACM and CMA Vocal Duo of the Year recently scored five ACM Award nominations including their first nod for the prestigious and fan-voted Entertainer of the Year for the 50th Annual ACM Awards airing on CBS on April 19 from the AT&T Stadium in Arlington, TX. Fans can vote for Entertainer of the Year beginning April 8 at 3:00 PM ET/12noon PT at VoteACM.com through the third hour of the live broadcast. FGL has skyrocketed to stardom becoming the only artist in history to join Brooks & Dunn in achieving four back-to-back, multi-week #1 singles; breaking the record for longest #1 on Billboard’s Hot Country Songs chart and selling over 21 million tracks worldwide of their 2X PLATINUM debut HERE’S TO THE GOOD TIMES and ANYTHING GOES. In addition to collaborating across genres with sensations like Nelly and Jason Derulo, FGL racked up 13 industry awards throughout 2014, topping four of Billboard’s year-end charts and leading Forbes “30 Under 30” list.